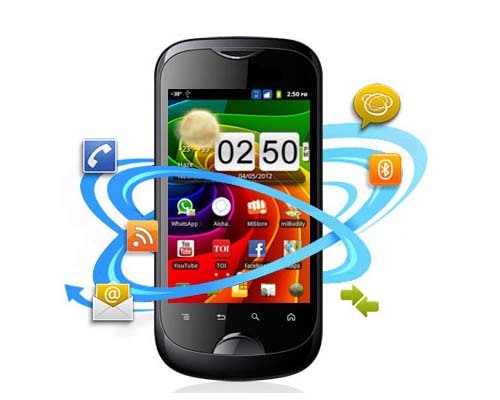 Micromax has announced their latest Dual SIM Android smartphone: - Micromax A80 Superfone Infinity. Micromax A80 runs on Android v2.3 Gingerbread operating system and powered by 800 MHz processor. It has a brilliant 3.75 inches TFT Full multi-touch screen with Sturdy & reliable 262k color display. Micromax A80 is loaded with 512 MB RAM of internal memory and the external memory is up to 32GB. It is powered by Lithium-ion 2500 MAH mammoth battery which provides talk time up to 7 hours and standby time up to 288 hours. Multi format Video/Audio Player, G-Sensor, Light Sensor, Loud Speaker, 3.5mm Audio Jack, Bluetooth v3.0, GPRS/EDGE, GPS Navigation, WAP Google Browser and Social Networking Apps are the other features.